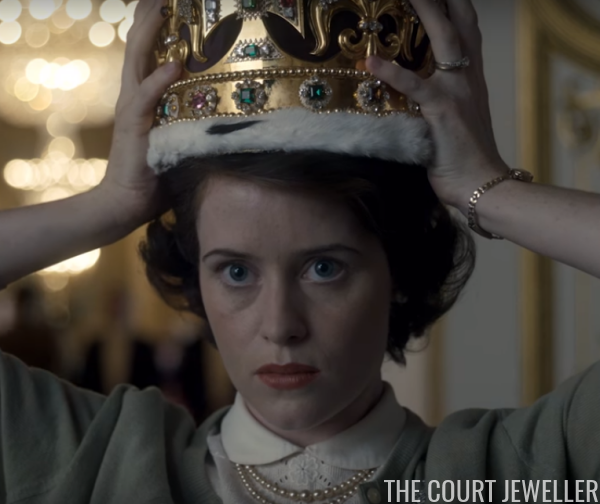 Yesterday, Netflix released another trailer for The Crown, their upcoming series about the life of Queen Elizabeth II. 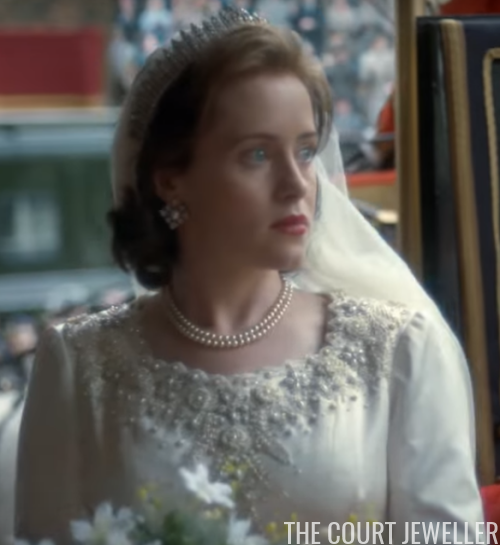 Starring Claire Foy as Elizabeth and Matt Smith as Prince Philip, the ten-part series premieres on Netflix on November 4. Let's have another look at some of the jewelry included in this new preview, shall we? 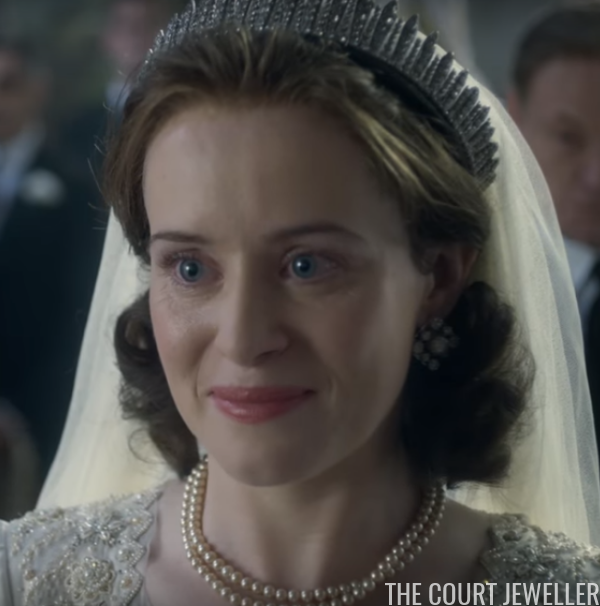 Scenes from Elizabeth and Philip's wedding are included in this new trailer, with two separate looks at her jewels from the day. Above, as she's arriving at Westminster Abbey, we see her wearing the production's versions of Queen Mary's Fringe Tiara (which famously snapped during her pre-wedding preparations), the Queen Caroline and Queen Anne Pearl Necklaces, and the Duchess of Gloucester's Pearl and Diamond Earrings. 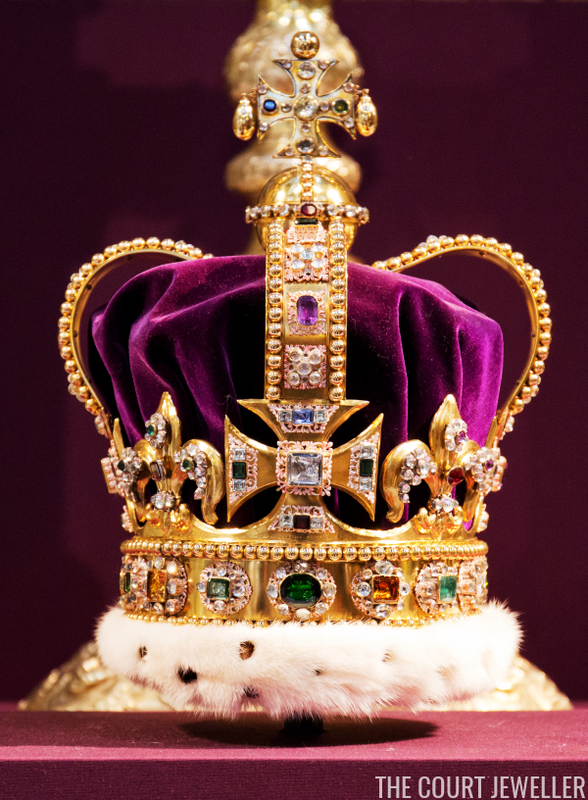 For comparison's sake: the Queen's real jewels on her wedding day. Here's the extensive post we did a few years ago on her wedding jewelry. And here's one more look at the production's version of the wedding jewels. General observation: it's tough to make a fake tiara look real. 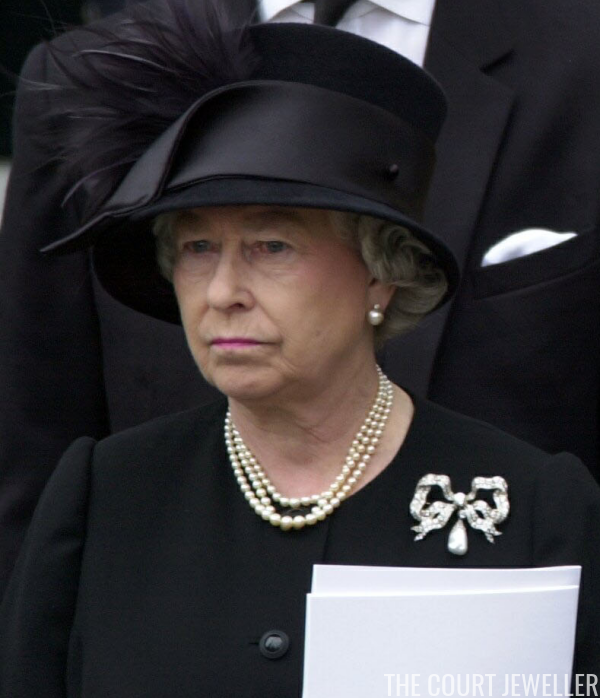 We see Elizabeth in mourning (presumably for her father, King George VI), wearing her usual pearls-and-brooch combination. This doesn't appear to be a facsimile of any of her real brooches, which I think is a smart move. (I also think it's necessary, because I can't recall seeing any photos that clearly show her brooch from the day.) Better to gently reference some of the jewels than to imitate them badly, perhaps? Here's the real Queen Elizabeth in mourning for her father at his funeral in February 1952. The new Queen tries on St. Edward's Crown in this image. If it's hard to make a faux tiara look real, it's really hard, apparently, to make a fake crown look like a real one. The metal here is very plastic-y looking. The reference is clearly this portrait, taken in 1953. 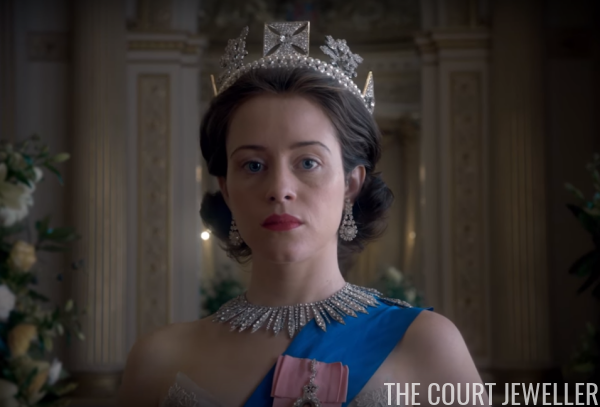 The production has replaced the brooch with Elizabeth's family orders (those of George V and George VI). 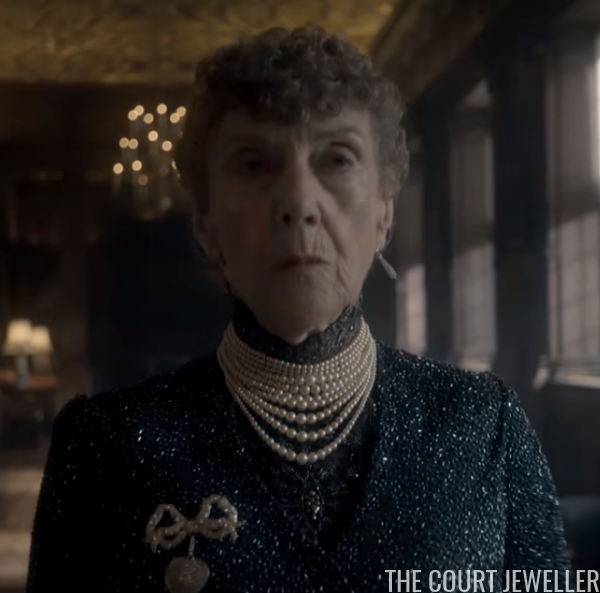 Here's a look at Dame Eileen Atkins as Queen Mary, who strides so forcefully down this corridor that her earrings are blurry. Dame Eileen's version of Queen Mary is wearing a brooch that appears to share some features in common with the Kensington Bow Brooch, though it's not an attempt at an exact copy. 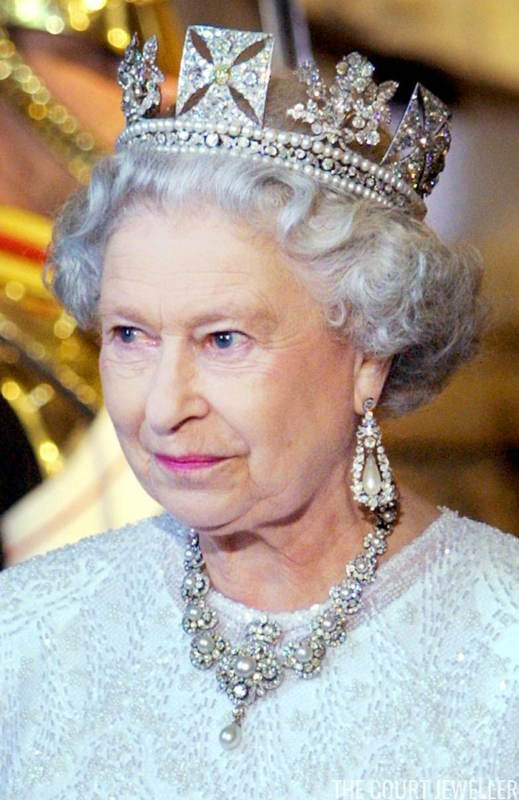 Yep, you're right -- that's Queen Victoria's Golden Jubilee Necklace on Margaret. 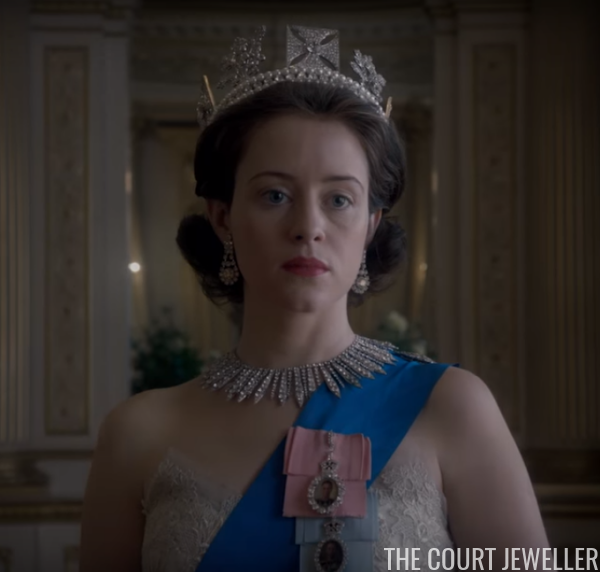 If you're confused, you're in good company: the necklace is an heirloom of the crown, which means it is worn by queens regnant and queens consort, not princesses. 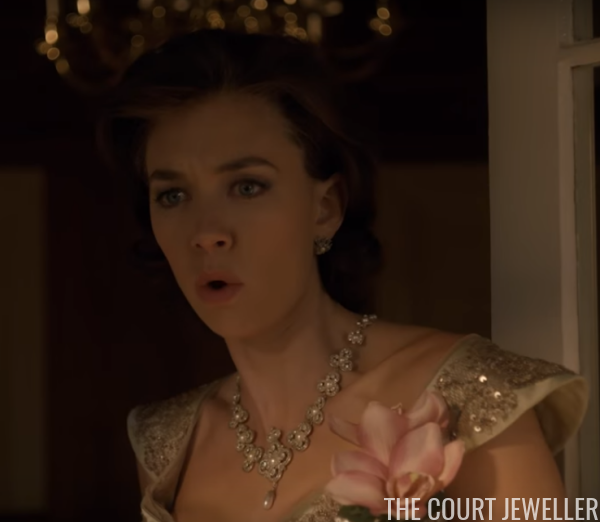 Maybe we should give The Crown the benefit of the doubt: perhaps there's a storyline about Margaret sneaking pieces out of her sister's jewelry box? 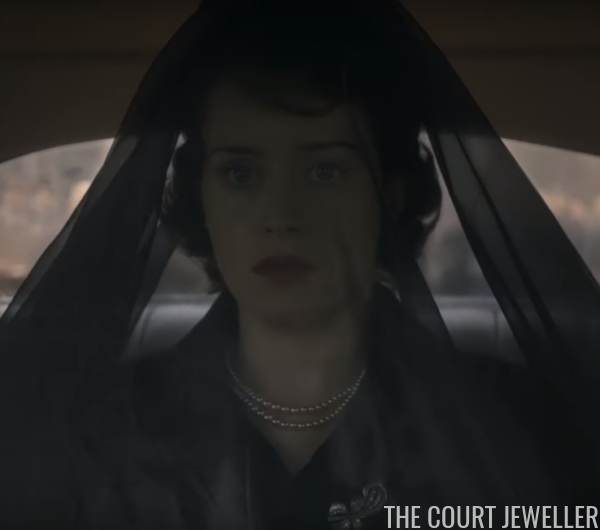 I assumed that her anger in the trailer was about the Townsend affair, as it usually is in films about Margaret, but maybe she's just being defensive about her obvious jewel theft??? Here's a look at the trailer. What are your thoughts on the jewels?